We all know that the new revenue recognition standard’s rules are in effect for the public companies beginning this year! 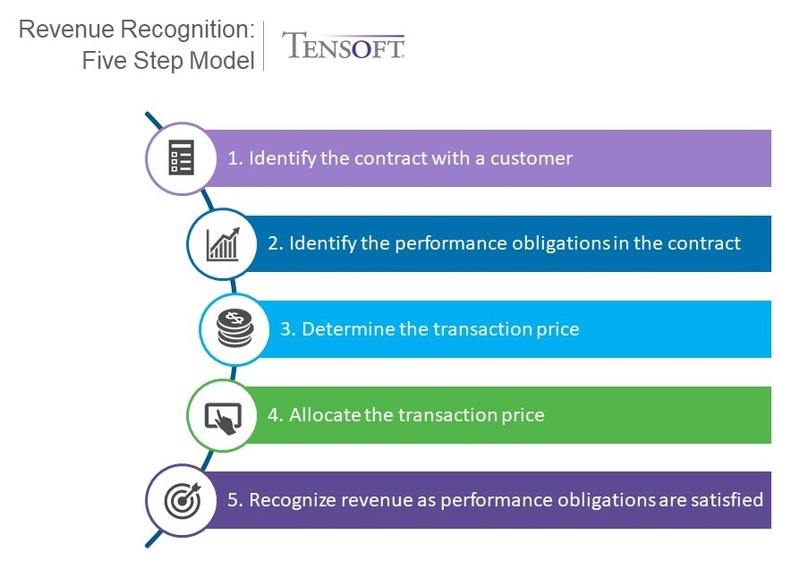 So how do the Tensoft revenue recognition solution fits into this new model? 1. Identify the contract with a customer: This document is called a ‘Revenue Agreement’ in Tensoft and can be created either from our contract module, from an invoice, uploaded into the system from Excel, or manually created in the Tensoft application. One of the most common question asked by our customers during this step is – how does Tensoft handle the requirement of big companies that need to disclose under both (old and new) methods in the first year? Tensoft has the ability to track two sets of books and create reports for the required ASC 606 disclosures and report them in parallel. 2. Identify the performance obligations in the contract: Tensoft’s rule-based engine has always defined this at the item level- goods/services level. The performance obligations correlate with the items from the item master but it can also include non-inventory items that are specifically used for revenue recognition. Tensoft also has the ability to split a Revenue Agreement line into multiple rules to define various revenue recognition patterns for the line. 3. Determine the transaction price: This is one of the key areas where the accounting rules have changed in terms of variable consideration and modifications. Under ASC 606, the total transaction price needs to be estimated based on what you ultimately expect to collect from the customer. This can include both fixed or variable amounts (a change from prior accounting guidance). Things like discounts, credits, rebates, performance bonuses, penalties, returns, refunds, price concessions, incentives, etc. need to be estimated and updated each reporting period. Tensoft can update the transaction price based on changes in estimates for variable consideration by changing the sales value of the associated performance obligation. It also can update the transaction price based on contract modifications (performance obligations added/removed, price changes, etc). These changes can be accounted under either of the two new ASC 606 options: cumulative or prospective. 4. Allocate the transaction price: Tensoft maintains default fair values for items/performance obligations and tags the transactions as delivered/undelivered. The compliance engine uses these fair values to allocate the transaction price either using the proportional or residual method. For contract modifications, the fair value is reallocated for changes to the total transaction price. 5. Recognize revenue as performance obligations are satisfied: Tensoft does detailed or summary level integration of revenue recognition journal entries with the ERP. It maintains default “revenue rules” for items/performance obligations that define the revenue recognition pattern (milestone, short-term, straight line, percent complete) and the time period for which it should be recognized (immediate, days, months, etc). These revenue rules can be modified based on the facts and circumstances of each contract. For more information on this topic or any of your revenue recognition needs, please contact us.